Changes to how aid loans are valued: how will it affect donor lending? As outlined previously, the changes the DAC have introduced are to be broadly welcomed. However, in order to assess their impact on ODA portfolios we have undertaken new analysis that looks at donor trends over time, the impacts of changing rules, and the implications for developing countries. What would ODA have looked like in 2013 if the new loans rules had applied? 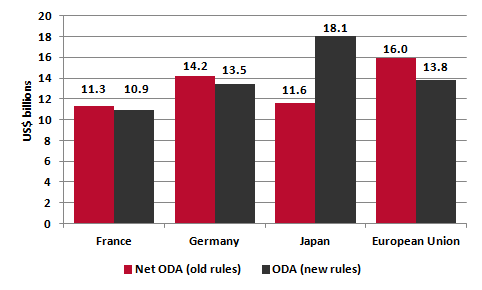 We compared the levels of net ODA reported by donors in 2013 to the amount of ODA that donors would have reported if the new rules had applied in that year. In aggregate the differences are not large: we find there would have been overall a 4-5% increase in the level of ODA reported by DAC donors in 2013. Most donors would see a relatively small change in the total value of their aid, amounting to no more than a US$10 million alteration in each case. However, some key donor portfolios would look significantly different. A few donors would see their overall ODA totals drop by applying the new rules to 2013 volumes. Germany would see the biggest decrease of all donors in the total volume of its 2013 ODA – losing 5.4% (US$770million) from the total; France would have reported $445 million less – a fall of 3.9%. The reason for this is that these donors’ loans have relatively low levels of concessionality and, under the new rules, loans with higher levels of concessionality count for more ODA than those with lower levels. Japan would see the biggest overall impact to its 2013 aid from the new rules with a significant increase of 56.3% in value, worth an extra US$6.5 billion added to the Japanese ODA total. This would mean Japan becoming the 2nd largest donor overall. Japan’s ODA loans are among the most concessional of any DAC donor. Also, Japan receives more in repayments on existing loans than any other DAC donor. Under the current rules these repayments are subtracted from the headline ODA figure, but this will not be the case under the new rules. Some other donors would see smaller increases: ODA from the United States (US) would increase by US$536 million, a 1.7% increase. (The US no longer gives ODA loans; again, this change is accounted for by the fact that repayments will no longer be subtracted from the total). Spain would also have reported an additional US$228 million, a 9.6% increase. Complete information on the potential effect of the new rules for all donors can be found in our report. It is impossible to know how the proposed changes will actually affect allocation. DAC allocation decision-making is being affected by the new rules as we write, and the patterns of ODA lending we see in 2014 and 2015 data may well look quite different. Yet, this analysis is still instructive. It gives an indication of the kind of incentives that might influence DAC donors as they continue to negotiate and finalise the changes to concessional loan rules within the DAC in 2015. Some issues, such as how to factor in debt relief and interest repayments into the totals, are still being resolved. Further attention therefore needs to be given to the potential impact of ODA loans and incentives for donors, especially relating to the possible outcomes for their partner countries. This data comes from the recently published report, ‘ODA Loans – tracking a growing source of development financing‘. The report analyses ODA loans more broadly, including donor trends, impacts of changing rules and implications for developing countries. For the purposes of this analysis we calculated the grant element of each new ODA loan commitment made by donors in 2013. The grant element percentages thus calculated were applied to amounts disbursed in 2013. As some of the loan disbursements made in 2013 relate to loans agreed in previous years, this makes the assumption that the current concessionality level of ODA loans from each donor was broadly the same in 2013 as in previous years. Since there is insufficient data on old loans to calculate the concessionality level of every loan that disbursed in 2013, this method gives us the best available estimate of the effect of the rule changes on loan disbursements.